Here’s the thing – I started off with good intentions (and by good I mean “healthier”). 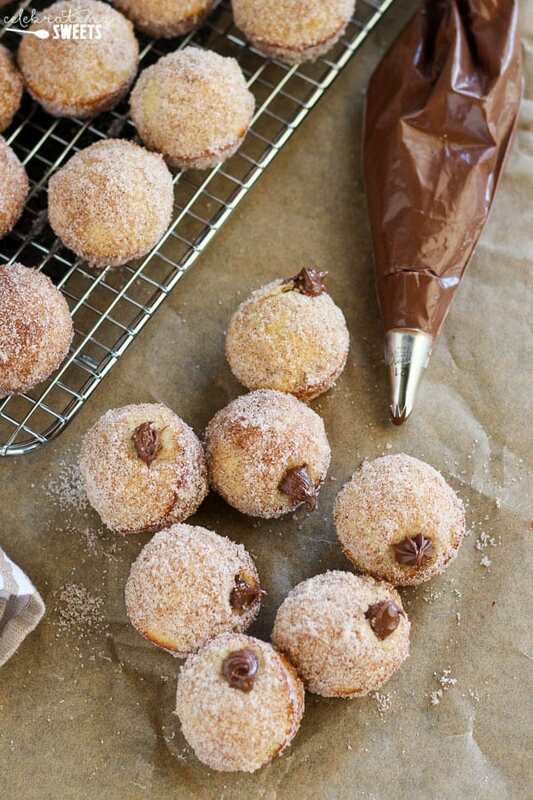 These adorable donut holes are baked instead of fried. Yippee! But then I went and brushed them with butter, rolled ’em in cinnamon-sugar, and filled them with Nutella. Gah! I’m sorry. And you’re welcome. Just plan a liiiiiitle extra gym time this week. These things are so addictive. I totally lost count on how many I ate. Technically I could count the remaining donut holes and do the math, but I’ll skip the shame and say I ate “a few.” Also, I should note that I did start this week with the intention of consuming little to no refined sugar, and then I realized that tomorrow – Friday, June 3rd, is National Donut Day! So, I pretty much had to make donuts. I did this for you guys. 😉 That’s what friends are for, right? 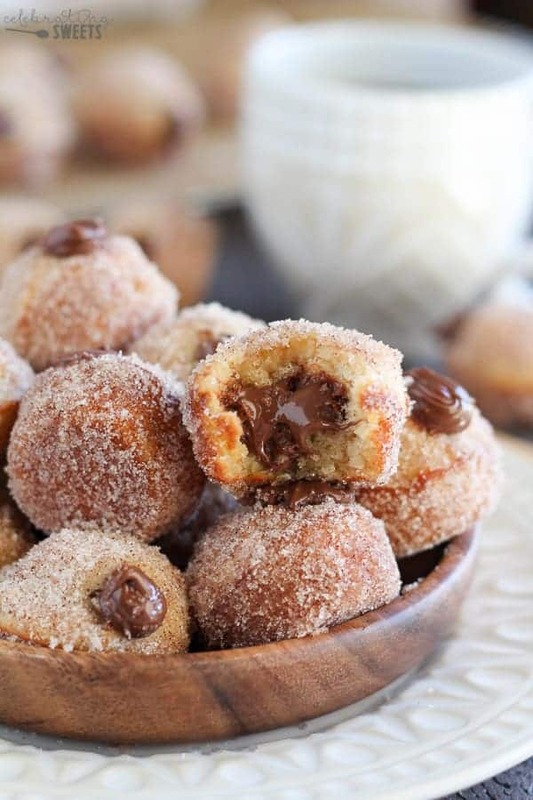 Nutella Stuffed Cinnamon Sugar Donut Holes for everyone! Let’s talk about these beauties. Have you had a baked donut before? When baking donuts instead of frying them I like to top/coat the baked donuts in something that will add a little crunch. That helps give some of the texture that is usually lacking in a baked donut. Granulated sugar, toasted coconut, mini chocolate chips, nuts, and sprinkles all add nice crunch to the outside of a baked donut. 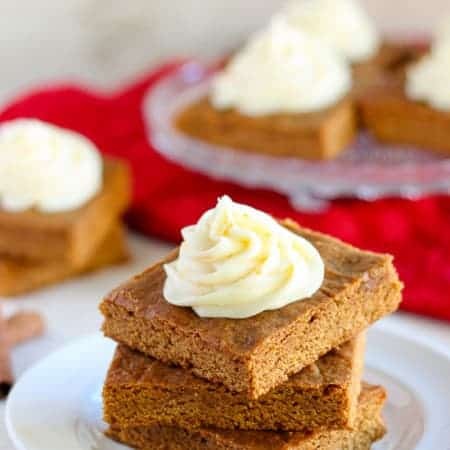 For this recipe I used cinnamon sugar. In order to get the cinnamon sugar to stick to the outside of the donut holes, I brush the donuts with butter (I know) and then roll them in cinnamon sugar. You can totally eat them just like that, or, you can put some Nutella in a piping bag and fill the donuts with a good sized dose of the creamy chocolate hazelnut spread. They’re great either way! Breakfast, dessert, midday snack? All of the above? You choose. You will love these flavorful donuts/doughnuts (← which is it?). I’m going with donuts. It feels less fancy. 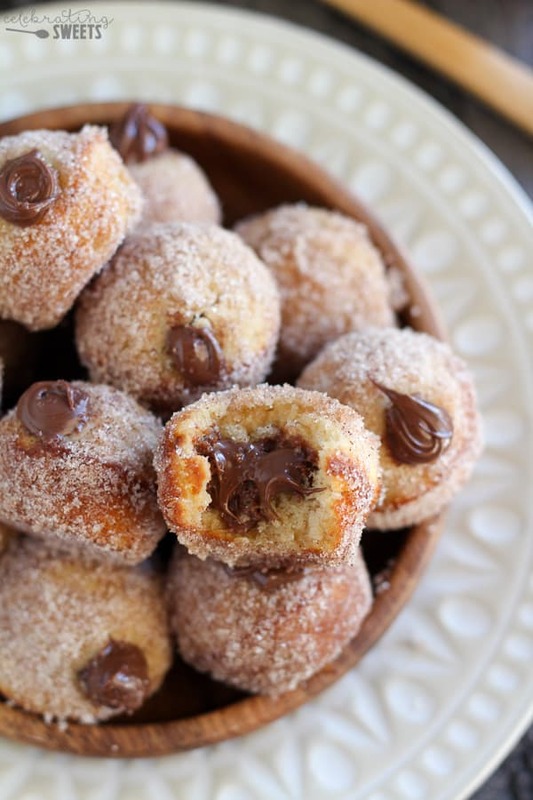 Baked vanilla donut holes coated in cinnamon sugar and filled with creamy Nutella. 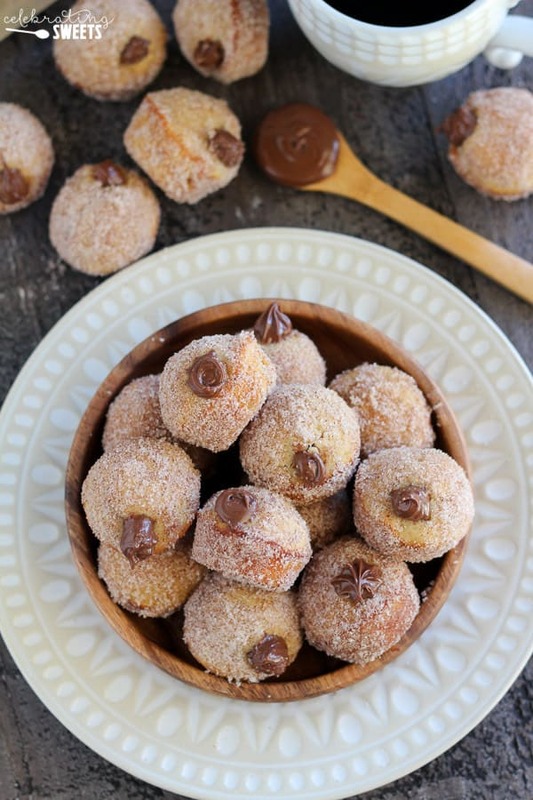 Use a mini muffin pan for these addictive homemade donuts. No frying necessary! Preheat the oven to 400°F. Thoroughly grease a 24-count mini muffin tin. 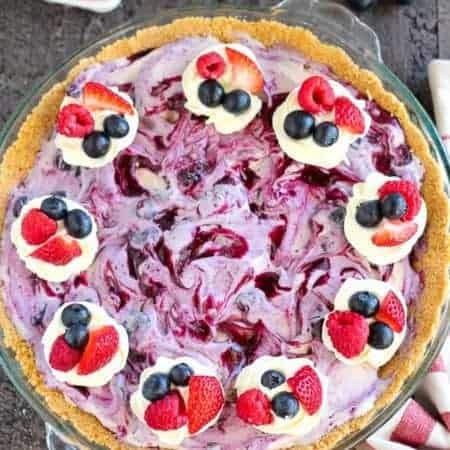 Using a hand mixer or stand mixer, beat the vegetable oil and sugars until smooth. Add the egg, beating to combine. Stir in the baking powder, baking soda, cinnamon, salt, and vanilla. Add half the flour, beat until combined. Add the milk, beat until combined. Add the remaining flour, beat until combined. Divide the batter between 24 mini muffin cups. I used a cookie scoop and placed a heaping 2 teaspoons of batter into each cup. Bake for 8-10 minutes, until the top springs back when you touch it. Place on a rack to cool for a few minutes. Set up two large shallow bowls. Place melted butter in one, and combine sugar and cinnamon in the other. 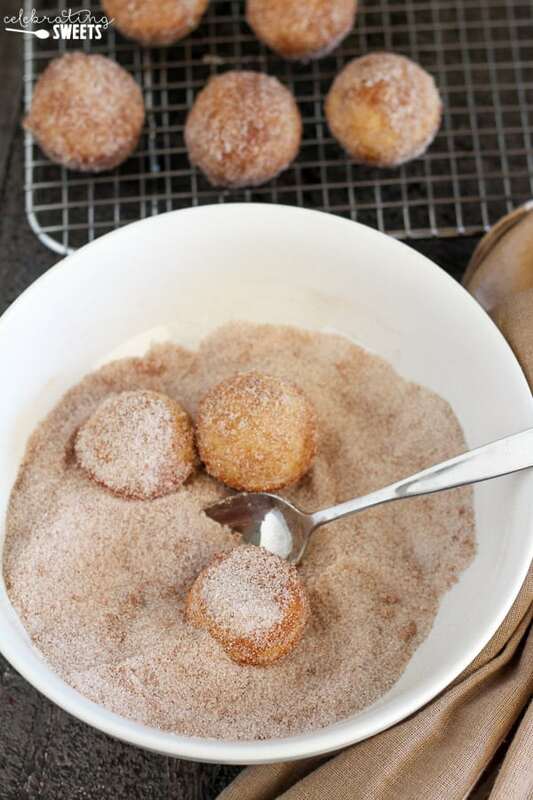 Once the donut holes are cool enough to handle, lightly brush them with butter, then immediately roll in cinnamon sugar. 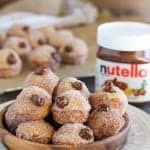 Fill a piping bag fitted with a small open star tip with Nutella and gently insert the tip into the side of each donut hole and squeeze a little Nutella inside. Nutella AND cinnamon?! I’m in! They look delicious. How could something so small make me drool so much? These look so stinking cute and so stinking delicious. I must try these soon! i came for the peach dessert and landed here. whoops. these look amazing. if i leave the browser open and my husband sees it i’m going to be in trouble cause i don’t keep white flour in the house for this reason 🙂 i’d eat the whole batch. your site looks awesome by the way!!!!!! the visual appeal is top notch! Ha! You’re so kind, Rachel! Thank you! These may have been the best things I have ever tasted! Just made them this morning for my family for a treat. Can’t wait for them to try them. Thank you! Yay! I hope your family loves them. Thanks for sharing! OMG! it was love at first sight 😀 I recently had donuts from a bakery with Espresso ganache in it. 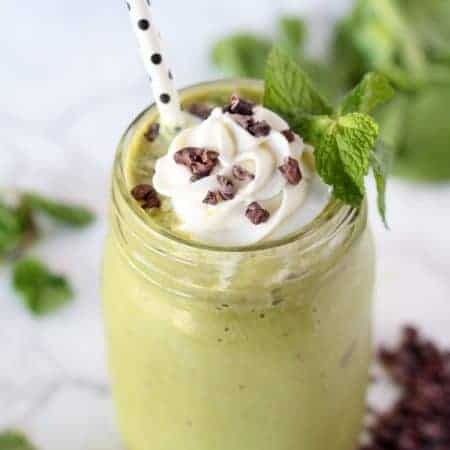 I have made these twice and they are absolutely delicious! I’m glad to hear that. Thanks for stopping by! Has anyone tried these with a non-dairy milk? Thinking almond, or soy. I haven’t tried it, but it should definitely work. 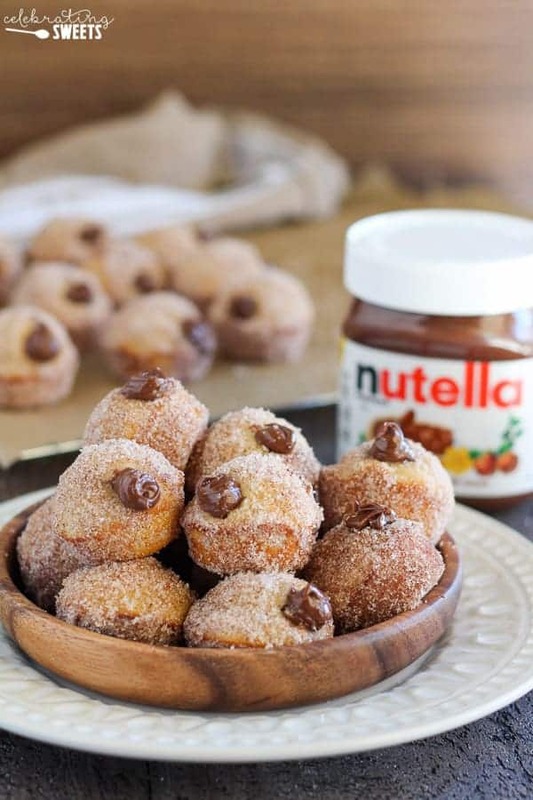 Just FYI, there is dairy in Nutella as well as in the melted butter that you brush the donut holes with. So swapping the milk won’t make them dairy free. Enjoy!